LG helped launch Android Wear with the original G Watch which many people purchased, including myself. This was our first experience with the new platform but the Moto 360 was always the main attraction due to round design. 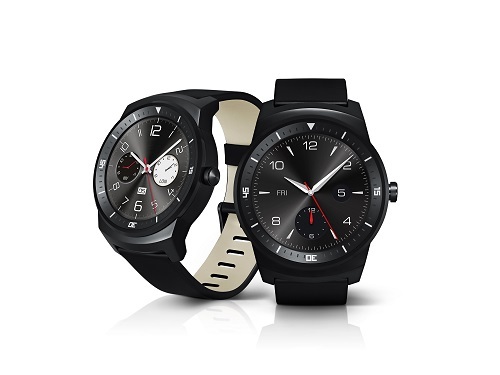 Well LG have decided to join in with the round watch design and just announced their new version of the G Watch, called simply the G Watch R.
Available in Q4 this new watch features a 1.3 inch P-OLED screen with resolution of 320 by 320 pixels, a Snapdragon 400 processor clocked at 1.2Ghz, 4GB storage and 512mb of RAM. The battery gets a small spec bump to 410mAh and the R also keeps the IP67 rating for dust and waterproofing. There is also now a heart rate monitor on the back to help with the new apps that track this, something people might want to do and is found on the Samsung Gear range. No mention on a price yet and this time you only have the option of Black, but the new watch will certainly give the Moto 360 a run for its money. With Android Wear™ at its core, the LG G Watch R delivers essential and relevant information exactly at the right time and place through voice recognition notifications. With a suite of LG health and fitness apps, users can also monitor their heartbeats with the support of the embedded photoplethysmography (PPG) sensor. And the smart notifications provide users with important reminders of missed calls and messages, upcoming meetings, events, and local weather forecasts. Huawei tease with .. 7 Mates ?